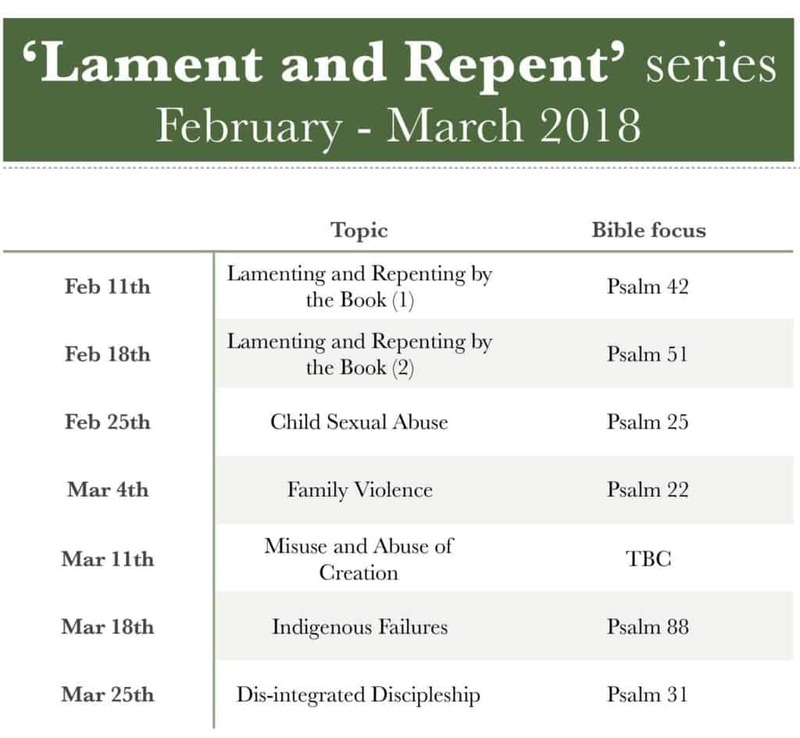 Our current preaching series, “Lament and Repent”, is and will be covering tough topics. We’ve chosen to confront the sins of the past and present, as a way of preparing meaningfully for Easter and in partnership with the wider Anglican Church across our state. See below for the range of weekly focus areas. During each, we will hear God’s word in Scripture, lament over and repent of the sin, and grab hold of God in hope. It is likely that the public discussion of these and related issues may cause grief, distress, or unexpected emotions to surface for people within our church gatherings. That’s one reason for this clear communication. And whilst hard, we can also expect this season to be one of healing, forgiveness, and renewed joy in Jesus. No matter how you engage, we wish to offer good prayer support for whoever needs it. We plan to set aside the Chapel (St. Peter’s) as a place of quiet reflection and prayer ministry, from about 10:20am/6:20pm onward during the next five Sunday mornings/evenings. A small prayer team will be there, and their role will be to listen, pray, read the Scriptures, and offer whatever other forms of support are appropriate. People may simply wish to enter the Chapel to sit safely alone in the quiet. There will also be a ‘fact sheet’ made available to the congregations each Sunday, with contact details for support services and other resources.